Often times I find that bathrooms tend to get rather neglected. Alot gets spent on the bigÂ ticket purchases bath/sink/taps etc but then theyÂ kind of get overlooked. Yet I kind of want my bathroom to feel just like any other room in my space so beautiful but with an element of whimsy so in that way I don’t feel like I’ve suddenly walked into some alien space. I like hotel bathrooms but I don’t love them. Luxurious they may look and feel but they are personality less. 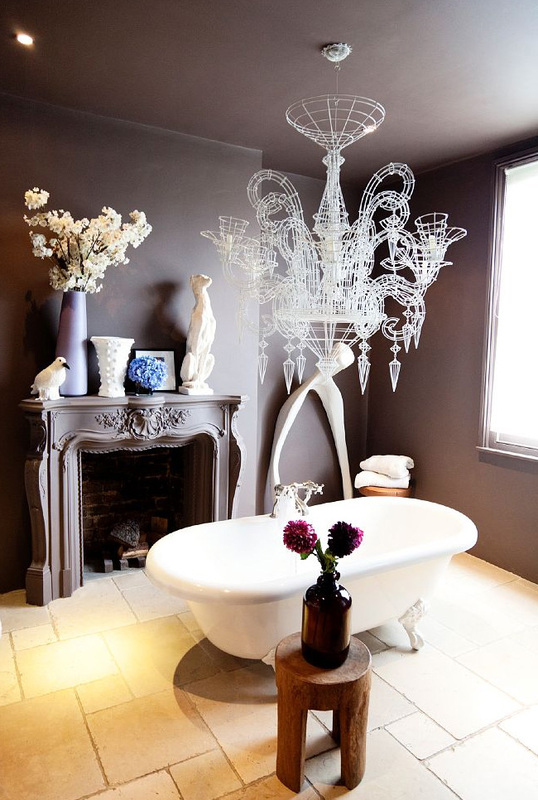 So if you want to inject a bit of wow factor into your bathroom here are some sure and trusted tips used by moi time and time again. Think big – I’ve got an obsession (as you probably all know) with creating magical interiors and to do that you need to think big. So I’ve sourced bath taps as my sink taps and plonked a rather large mirror over the sink. Suddenly the sink looks and feels a little more A list – gone are the conventional small taps and wham bam its in with the big. Next I’ve suspended a chandelier over the bath that is also super sized. Yes its hung way to low and I bang my head constantly when getting out of the bath (who cares) but it adds an element of whismy. The only person who never bangs her head is Maud being so teeny tiny but then she hates bath times no matter how many ducks, bubbles, games we might play its a scramble to get out. I digress – lets move onto paint – probably where I should have started but my mind works in odd ways. The most transformative thing you do to a room is to paint it a colour – its radical, a little brave but it totally and utterly ups the style ratings. Skim a rug on the floor a chair in the corner maybe a cluster of candles and suddenly you’ve got yourself a pretty cool bathroom. 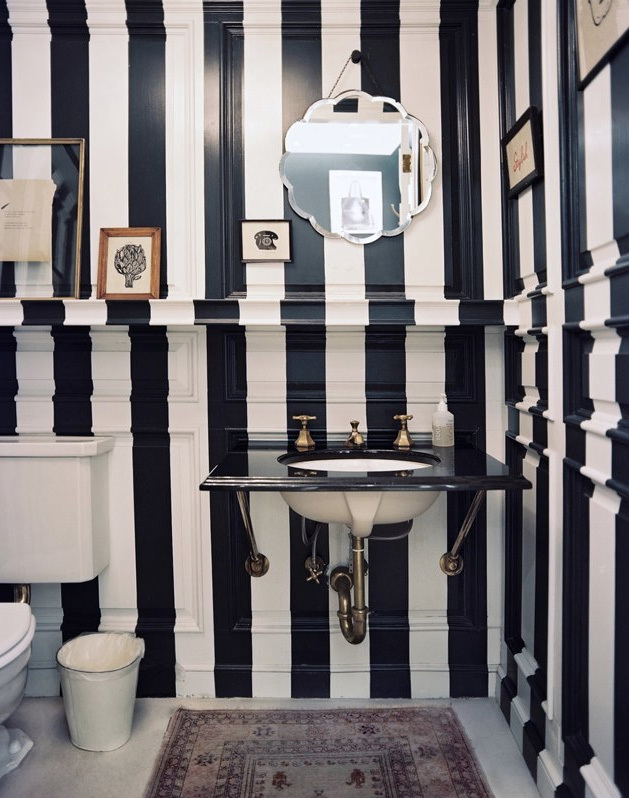 My bathroom photographed by Todd Selby. The paint colour is London Clay by F&B and all the flowers are faux of course from the store. This space is teeny tiny but way more dramatic and fun. The stripes do all the talking you almost don’t need anything else.